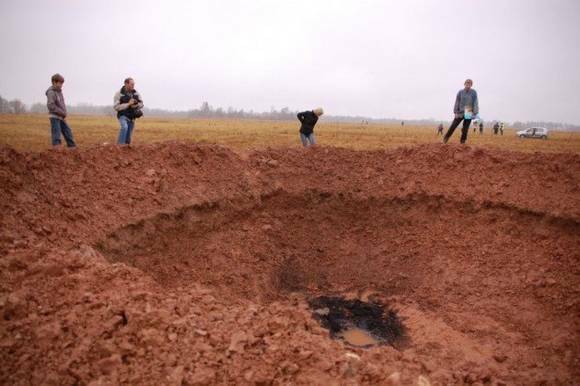 A very strange incident happened near Latvia-Estonia border on Sunday, October 25/2009, which attracted media attention all around the globe. A UFO was spotted by a local witness, hitting the ground with a loud crash, forming a crater with burning flames. The event took place near a small town Mazsalaca in northern Latvia. Fire department, police and even military personnel arrived to the place immediately, cordoning the territory. Rumors have been passed that radiation was detected. This was untrue, however military officers have indeed performed a radiation check. 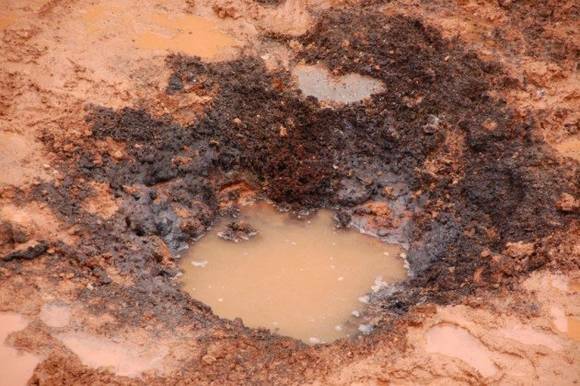 The crater was 9 meters in diameter and 2-3 meters deep. The initial versions that there was an alien UFO, a meteorite or a space satellite wreckage. 1. Meteorites are never hot (nor in flames) when striking the earth, actually they are usually colder than the ambient temperature. This is because they come from space, where the environment is only a few degrees above absolute zero and the whole descent-to-earth duration rarely lasts more than 30 seconds. Not long enough to warm up the meteorite's core. 2. 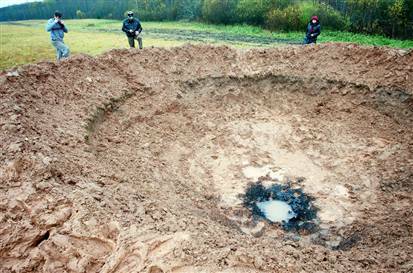 According to our consulting astronomer, to create a crater this big there had to be a meteorite at least a 1.5 meter in diameter, but the photographs clearly showed a small empty hole with burned sides in the center of the crater. The official investigating scientists came to a similar conclusion. 3. The edges of the crater looked like it was dug out manually and not created by a crash. Grass around the crater was unaffected. 4. Parts from space satellites does not create craters, because of their low kinetic energy (low weight and slow reentry speed). 4. We also didn't see this event as a possible alien UFO crash because of it's size. Despite this, many UFO networks has shared this event, classifying it as confirmed “alien UFO crash”. We at UFO Baltics, however, cannot imagine an alien ship being smaller than 1 meter in diameter. Later a mobile phone operator company “Tele2” took responsibility for producing this spectacle as a publicity stunt for advertising purposes. Latvian government sued the company for the expenses dispatching the special services and scientists to investigate the case. 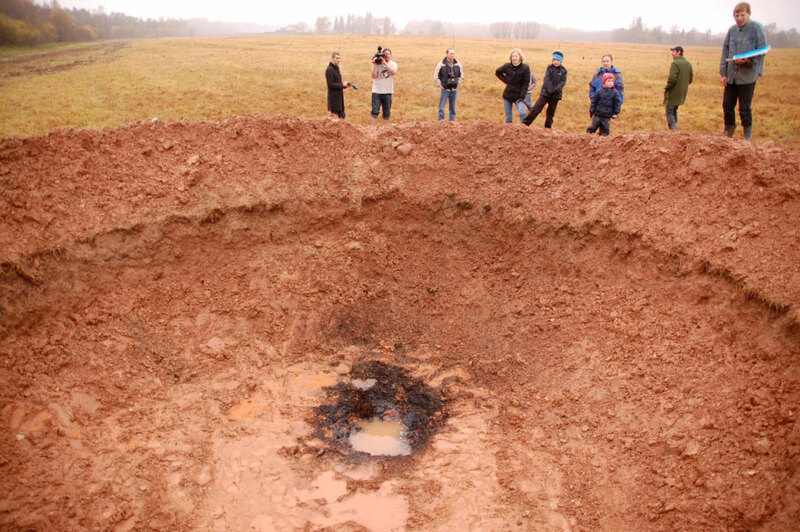 The burning substance was later proven to be the “Thermite” (a pyrotechnic mixture of aluminum and iron) and the crater was intentionally dug by shovels. However, there is one interesting lead that caught our attention. Why did the military officers measure the radiation? There are tens of thousands meteorites striking earth every year and only one meteorite in history, found in Japan was emitting a barely measurable count of radiation. Most of the meteorites are made of rock and iron and they do not emit radiation. However some well known UFO cases, like the Rendlesham forest incident, has a documented raised radiation levels in the territory. "The territory has been immediately cordoned off as we still do not know what fell down from the sky. According to preliminary information, it was a meteorite. However, it is possible that it was a [space] satellite or its fragment. A radioactive contamination is also possible"
But as we proposed in our previous article, “Two policemen witnessed UFO in Lithuania”, there seems to be a pattern of government's response to situations like this – this could mean there are prepared protocols for UFO encounters or UFO crash sites and this is not the first time when military performs an almost professional UFO investigation on sites like this one and takes UFO occurrences very seriously.